A sweet and tangy onion condiment that’s perfect on sandwiches, tacos, burgers, nachos, salads or anything that needs some extra zing! They are bright, crunchy & delish!! 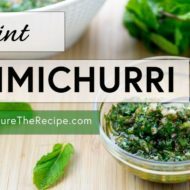 I have loved this condiment for some time now. 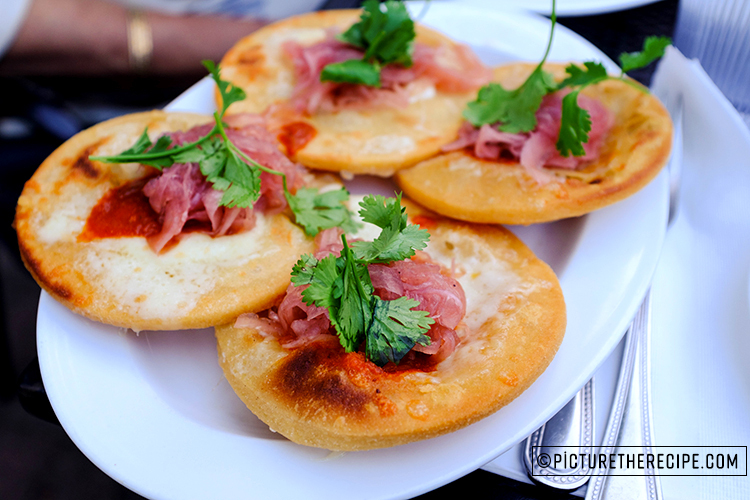 I’ve had it on street tacos…yummm, tostadas, burgers, sandwiches and appetizers and I have always liked them. 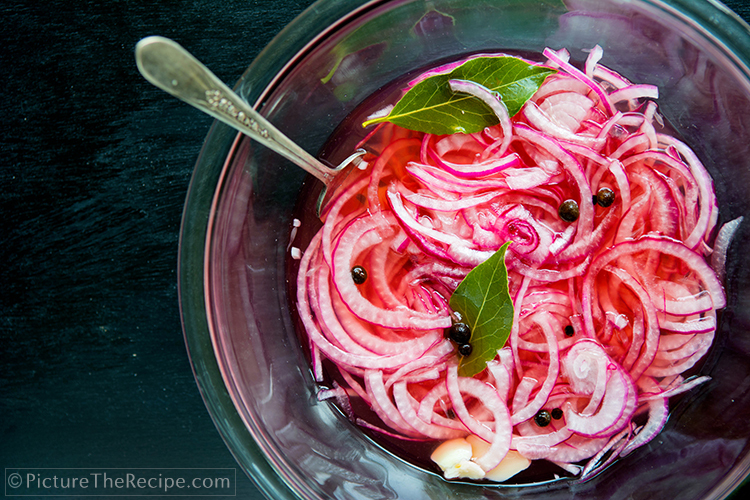 Red pickled onions add a little sweet n’ tangy zing to dishes that seems to lift it up. It also adds a crisp-crunchy texture too. Not only do these pickled onions taste good but they also visually brighten up a dish which I feel is important as you tend to eat with your eyes first. But, I’ve never thought to make them and have a jar handy at home…until now! I know….shame on me! This summer while visiting family in Minneapolis, we went to a restaurant called BRASA that served up some of the most delicious food inspired by Southern U.S, the Caribbean and Mexico. Everything we ordered (which was over half the menu) and tasted was amazingly non-fussy, clean and very delicious. Their flavors were unique and precise and everything from the yucca fries with a citrus garlic Mojo sauce that you could drink plain…to their perfectly crispy skin creole dry-rub rotisserie chicken was memorable and left you wanting more. But there was one little dish I really couldn’t stop thinking about even weeks after I got back home- their Spicy Masa Cakes (pictured below). It was a simple corn masa cake with a little melted cheese, a spicy red sauce topped with some pickled red onions and fresh cilantro. Boy was it was good! …oh so good I had dreams about it!….and I just had to recreate it. To start of, I had to perfect the pickled red onion. So after a couple onion pickling attempts….I nailed down my perfect blend of tangy (which involves two acids to add dimension) and the right amount of sweet with subtle but noticeable flavors of all spice, garlic and bay leaves. It turned out so good, I just had to share the recipe on here and couldn’t wait for the spicy masa cake recreation recipe to post it (which I also nailed…no big deal! 😉 …so wait for that recipe next week). 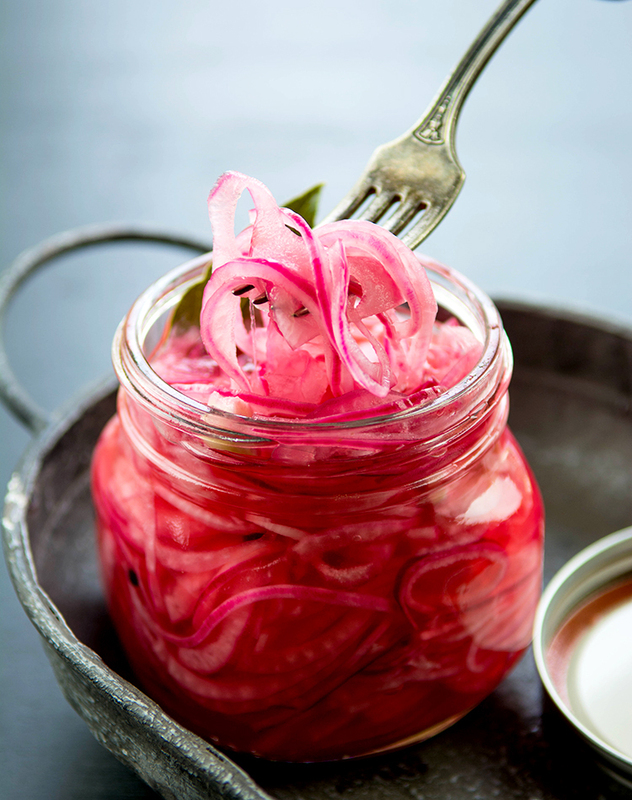 So, if you haven’t tried making pickled red onions already….I am here to tell you that you simply HAVE TO! 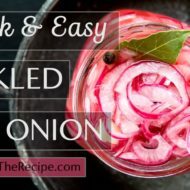 And not just any pickled onion recipe…..this particular one. You can thank me later….first try it, marvel at it’s pink-pickled beauty, put it on everything and don’t resist the urge to share it with every one you know. A sweet and tangy onion condiment that's perfect on sandwiches, tacos, burgers, nachos, salads or anything that needs some extra zing! 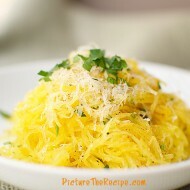 They are bright, crunchy & delish!! 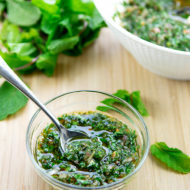 - Add the White wine vinegar, water, sugar, salt, garlic, all spice, black peppercorns & bay leaves to a sauce pan. - Bring to a boil on medium-high heat, stirring to dissolve the sugar. - When the pickling liquid comes to a boil switch off and pour the hot liquid over the sliced onions in a heat-proof bowl/ dish (that's non reactive to vinegar). - Add the lime juice and make sure all the onions are submerged in the liquid. Allow it to cool on the counter. - You'll notice the onions turning a bright vibrant pinkish color within a few minutes. You can eat them with an hour or two, but they taste even better if allowed to sit overnight. You can store the pickled red onion in airtight jars for up to 2-3 weeks in the refrigerator. - Enjoy them on burgers, tacos, nachos, sandwiches, tostadas, salads and more!